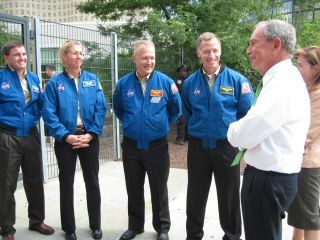 New York City Mayor Michael Bloomberg, right, greeted the STS-135 astronauts at the New York Hall of Science Aug. 17, 2011. NEW YORK — It wasn't quite a tickertape parade, but the final space shuttle crew was honored by New York City today (Aug. 17) with a proclamation by the mayor. New York City Mayor Michael Bloomberg declared today "STS-135 Atlantis Crew Day" by presenting the four STS-135 astronauts with a plaque during a ceremony at the New York Hall of Science in Queens. Later, he guided the astronauts on a personal night tour of the Ground Zero site of the Sept. 11, 2011 attack on the city's World Trade Center. The astronauts landed July 21 on NASA's 135th and final space shuttle mission, closing out the 30-year program. Now the crew is on a whirlwind tour of New York City that included a stop this morning to meet Sesame Street Muppet Elmo and greet the public at an outdoor science fair. Bloomberg thanked the astronauts for their service to the country, and said he was sorry to see the shuttle program end. "It's a sad day we don't have a manned space program," Bloomberg said. Ferguson gently corrected him. "But of course we have people on the space station," he said. "That'll be going on." NASA plans to send U.S. astronauts to the International Space Station through at least 2020, initially flying aboard Russian Soyuz spaceships and eventually on American commercial vehicles. The agency is also building a heavy-lift rocket and capsule to take people to an asteroid and Mars in the next couple decades. "We're here to tell you we have a very bright future," NASA deputy administrator Lori Garver told the crowd earlier in the day at an event called "What's Your Favorite Space?" at the Eventi Hotel in Manhattan. The festival included a giant inflatable Mars rover as well as stands offering demonstrations of robotics and spacesuit technology and make-your-own balloon rocket activities. The STS-135 astronauts shared the stage Aug. 17, 2011 with Sesame Street's Elmo, who asked them questions about life in space during the "What's Your Favorite Space?" event at New York's Eventi Hotel. Elmo, who also attended the STS-135 launch in person in Cape Canaveral, Fla., on July 8, peppered the crew with questions such as, how do you go to the bathroom when you're strapped in on the shuttle during liftoff? "We do actually have diapers under our spacesuits," Walheim said. Elmo also asked the astronauts how they felt about theirs being the last of the space shuttle missions. "Were you sad?" he asked. "I was a little sad that it was the last shuttle flight," Ferguson said. "While I hate to see it go away, I do understand." Today's event attracted space fans old and young. "I've wanted to be an astronaut since I was 6, 7 years old," said Oxford, N.J. resident John Ronkowitz, 41, who said he drove down to Florida last month to see STS-135 lift off. "To watch it come to an end was bittersweet. A lot of people think it's over, but it's not. Good things are going to come."